The extra-wide base on this ATD transmission jack lowers center of gravity and promotes stability. Features include rugged steel wheels and full swivel ball bearing casters, a unique handy release pedal that provides safety in lowering the load, and an adjustable ratchet style saddle for quick adjustment for most pan configurations. The chrome-plated rams maximize its high reach operated by a user-friendly foot pedal. The heavy-duty load control nylon straps hold transmission in place. 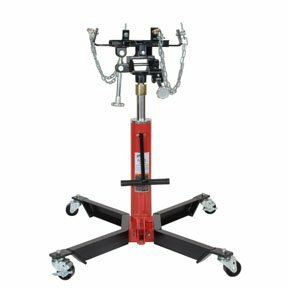 Buy ATD 7430 1000 lbs Telescopic Transmission Jack at Discounted Prices ✓ FREE DELIVERY possible on eligible purchases.